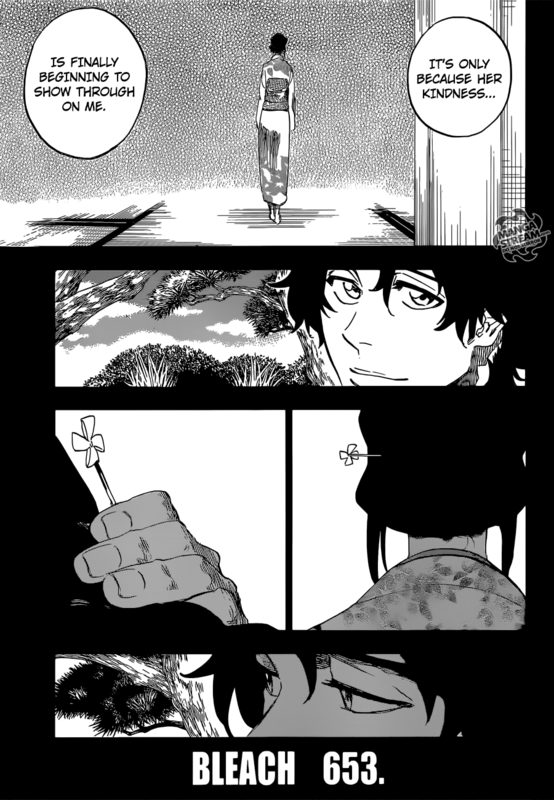 Shunsui’s brother say’s “he didn’t make a conscious effort to change”, but “because of Nanao’s mothers “kindness” he has changed. 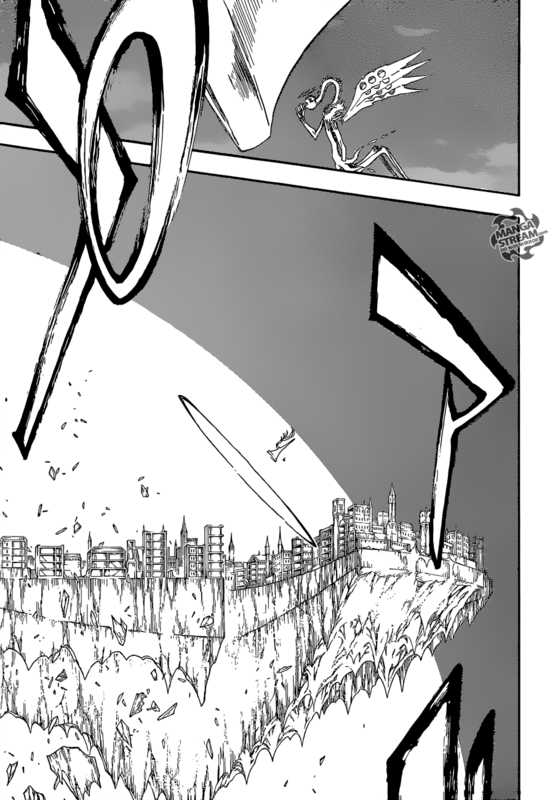 Meanwhile, in the present Nanao falls backward skidding across the ground. She thinks to herself that “fighting with a sword could be this frightening”, the pain she feels after having been “cut” shocks her. Her inexperience shows when she appears to lack the understanding that “wounds hurt”. 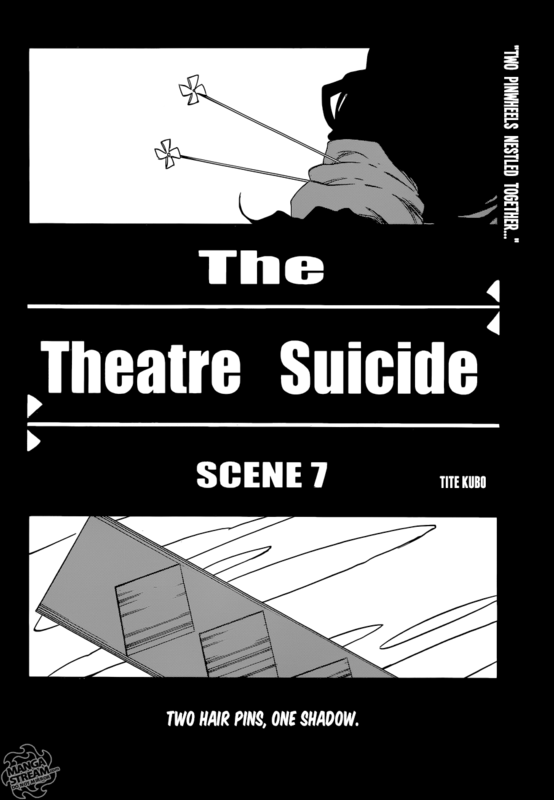 This chapter was unsatisfying. I think the symbolism of the hairpin was difficult to understand right away. Nanao’s battle inexperience makes sense. The fact that was surprised how much a wound in battle hurt seem somewhat silly. However, maybe she was surprised by the degree of pain. 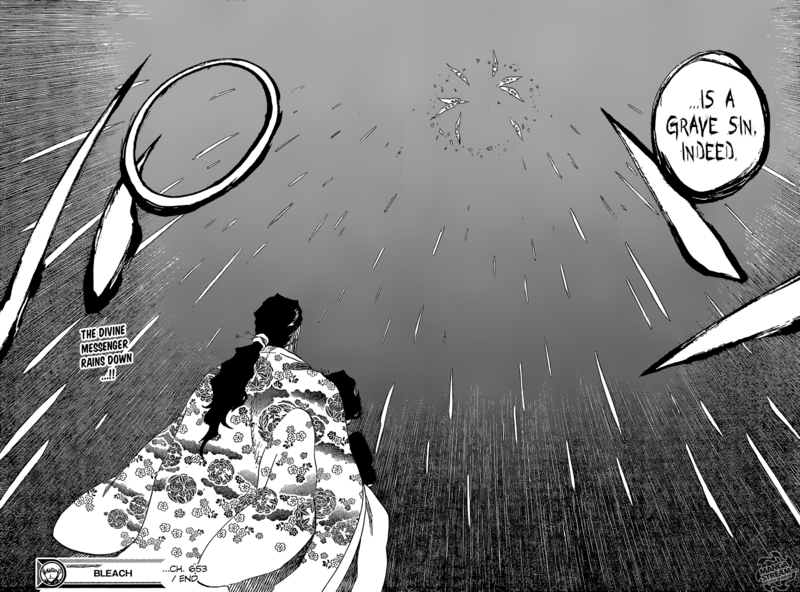 Regardless, there was very little to this battle after Shunsui’s Bankai. Nanao sword was way too overpowered. The “help” Shunsui provided was minimal at best. Furthermore, I’m still unsure whether Lille is dead. At this point, I’m over this fight and hope it has ended. 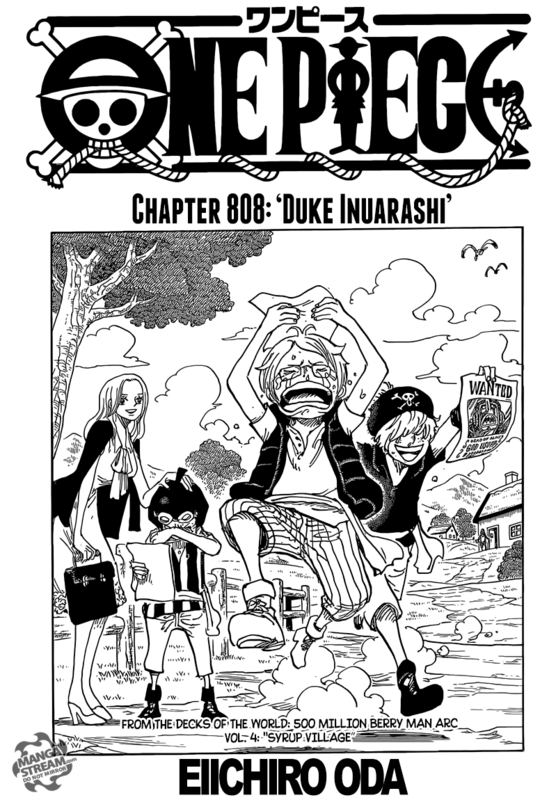 We flashback to the events proceeding the arrival of the straw hat crew. The minks are surprised to see a massive mammoth. The guard monkey rings the raid bell, warning that they are “being invaded”. 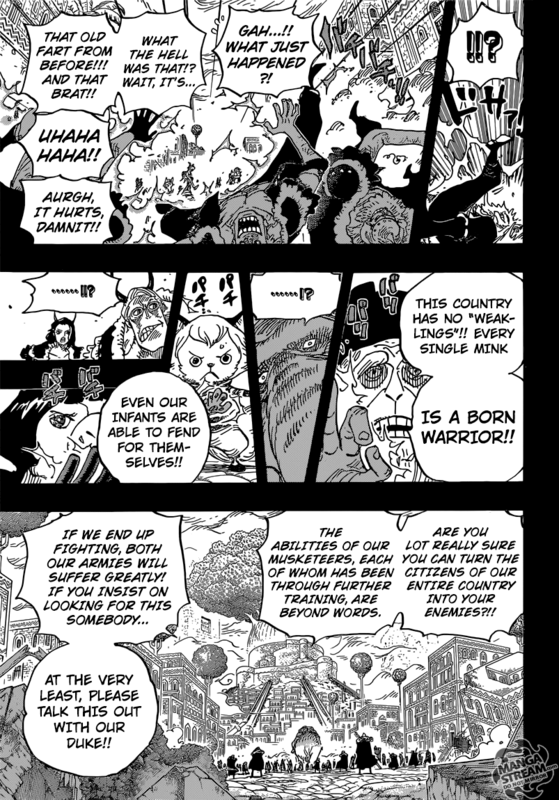 The mammoth surprising speaks and he asked if they “ever heard of the Wano country warrior, Raizo”. The minks claimed that they “never heard of him.” They ask him to leave and not destroy the country. The mammoth is Jack the drought. 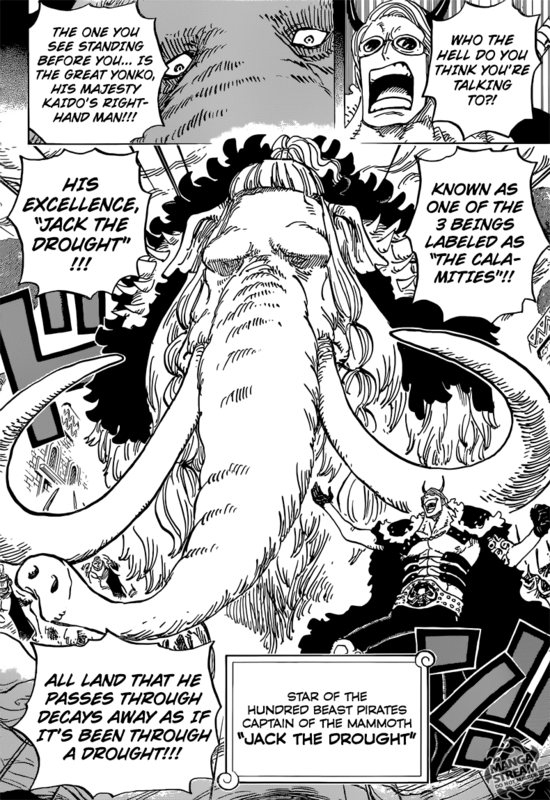 He is the “right-hand man of Kaido the Yonko.” He claims to be one of the three beings called “the Calamities.” Sheepshead tells them to hand over Raizo. He then threatens the “peaceful lifestyle” of the minks. Monji an elder mink tells them that they “must hear them out.” He suggests that they should “patiently” search for Raizo. Jack attacks with his trunk, destroying several buildings. Jack demands that Raizo should be brought to him. The minks continue to deny that Raizo is with them. Jack orders the Pleasures to attack women, children, and the elder. The minks use Electro to easily defeat the pleasures. Monji tells them that “this country has no weaklings” and that “every single mink is a born warrior.” He says the “even our infants are able to fend for themselves.” He questions the logic of Jack in attacking an entire country. This chapter revealed a lot. 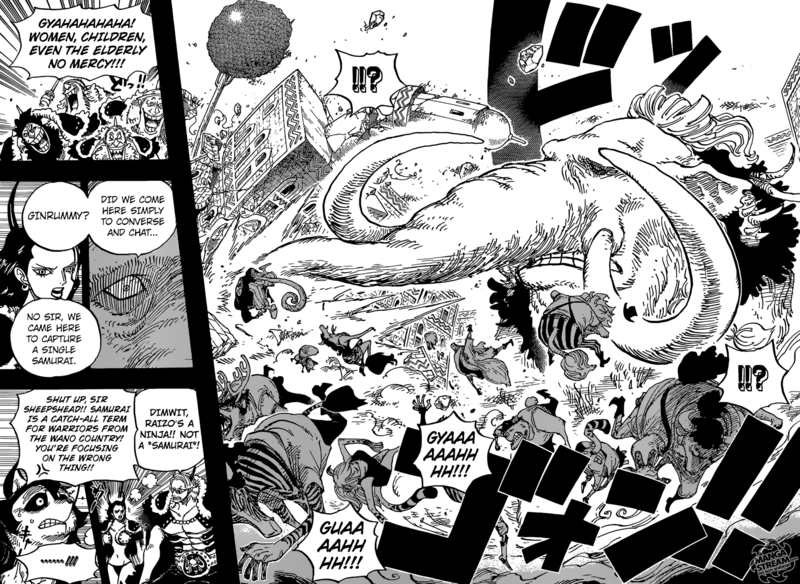 The fact that Jack is a mammoth (zoan devil fruit user) was very surprising. His power was wasn’t surprising, though. I’m impressed with the minks and their seeming natural fighting ability. The obsession with Raizo is intriguing. I wondering who he is and why they want him. The story arc is progressing nicely and I’m getting more excited for what will happen in this arc.